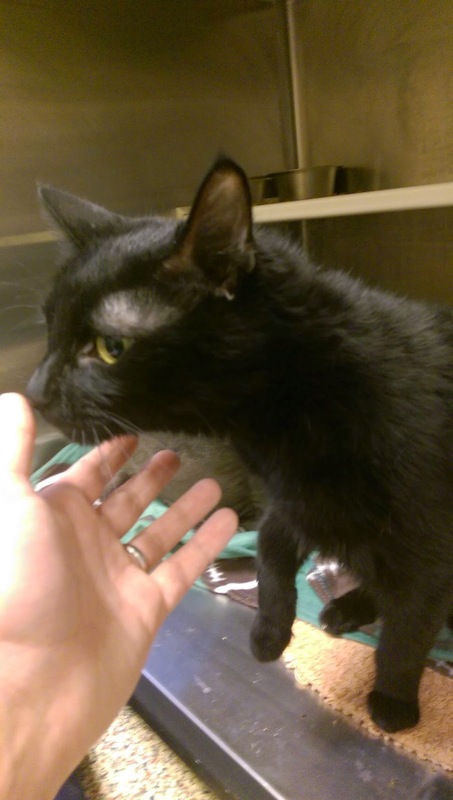 Gus: Continuing our goal of being more selfless in 2015, we are giving a little bit of our blog time to the kitties at Great Plains SPCA. "I am in love with a creature named Pishi. Only her name has been recently changed to Phoebe to make her more appealing to the public at large. Pishi translates to “cat” in Farsi and is used as slang for “beautiful”, “wondrous”, and “flawless.” Pishi is beautiful, but is also anything but flawless, and this is why I adore her. She is a timid little cat who watches the world from the safety of her bottom-level plexiglass and steel kennel in the animal shelter. Everyday through play and love, she becomes a little bit braver and is so proud of herself when she musters up the courage to step outside of her kennel to stretch her legs, dance, and peep around the corner, albeit for just a few seconds at a time. When I move on from her kennel to the other cats in the shelter, she stares up at me with these gorgeous, pleading green eyes. When I don’t acknowledge her, she dumps her cat food dish over the side of the ledge in her kennel so I will have to open her door and reach in to clean it up, giving her a few more moments of my attention so she can dance and love on me by slamming her head and side of her body into my face before running to the back of her shelter. As soon as I close her kennel door, she starts the whole process over. She is a slob. She crunches her dry food and it flies out of her mouth, landing all over her bedding and floor. She prefers to poop on the side of her litter box rather than in the litter box. I love her for all of these things. She can be a challenging little thing, but the rewards of her quiet and heartfelt displays of love and growing self-confidence are loud, wonderful, and worth more than I can describe here. Pishi was reluctantly surrendered by her family when her owner became ill and unable to care for her. 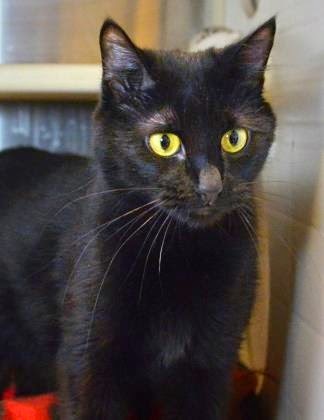 She has lived in the animal shelter since June 2014 and deserves a new home with an owner or a family who are willing to go slow and commit to her. She is undoubtedly going to thrive in the right environment and shower her family with unconditional love and amusement for the rest of her life. She is the type of pet who is worth every bit of patience and attention given to her and will reciprocate with unflinching love and loyalty. If you know of anyone who would love her and benefit from all that she is going to give, please look at the link below, or contact Great Plains SPCA in Merriam." Find out more about Phoebe. Gus: Jennifer describes Phoebe's spirit in such a beautiful way! Phoebe is so lucky to have Jennifer and her son on her side! Volunteers fall in love all the time when they volunteer but every once in awhile there is a special cat that touches their heart in a profound way. They wish they could take them all home but that just isn't possible. Please help us share Phoebe's story so we can find this girl her purrfect home.